Flooring is one of the first things you see when you step into the new Corrs Chambers Westgarth offices across Australia. RC+D worked with Bates Smart to deliver custom-designed carpets that fused premium quality luxury with workplace performance. When Bates Smart contacted RC+D to deliver a custom-designed carpet for the national roll-out of law firm Corrs Chambers Westgarth’s new premises, it was with a brief to create afunctional, robust and textural carpet that had the look and feel of premium quality luxury flooring, but could withstand the wear and tear of a busy workplace environment. “It was a national roll-out of new offices, with subtle local contexts for each state for this legal practice,” says Hayden Crawford, Bates Smart Associate Director and project lead designer. The design of each office responded to a sophisticated set of design principles, which reflected the individual city locations with the client facing areas (among others), “designed with a hospitality overlay” to give the spaces a unique feel that would sit comfortably within a corporate context. 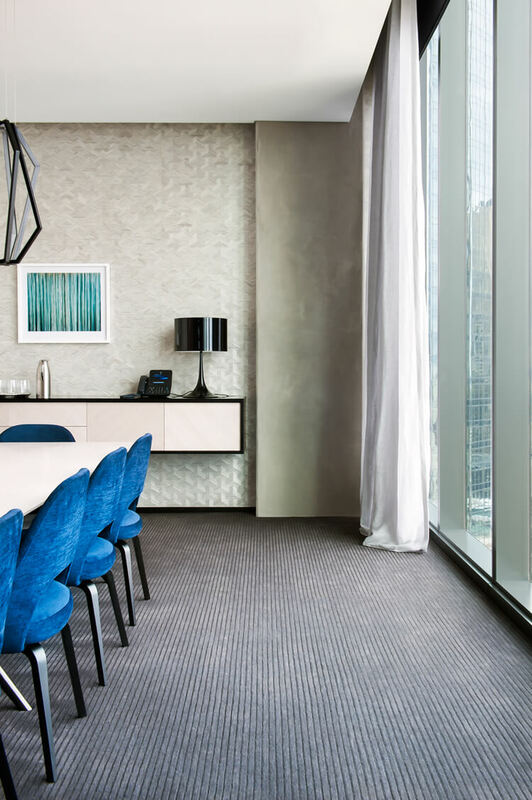 Working with RC+D, Bates Smart designed a hand tufted carpet that was robust, flexibly functional and suitable for roll-out across each office’s board room and main client facing areas. Client facing areas in particular, were designed for multiple uses –Client meetings, Boardroom, open seminars, dining events, large functions – meaning the rooms needed a carpet solution that was resilient and flexible to different occasions and modes of use, while also speaking to the overall design concept. Bates Smart opted for a plush finish, achieved with a combination of cut and loop pile using 100 per cent New Zealand wool combined with semi-worsted fine wool. This means the carpet is soft underfoot – giving it that extra luxurious feel as you walk through the spaces. The colour, “deep enough to hide spills and stains” and featuring a custom stripe, meant that the carpet could transition from one use to the next, without carrying obvious signs of wear and tear. “The other consideration was [selecting] a colour tone to coordinate and sit with the other finishes,” says Hayden. And, when you’re trying to create a hospitality look – softer, less corporate, as Hayden describes it – quality of finish is the top priority.